Here's a great way to network better, uncover more job leads -- and get hired. 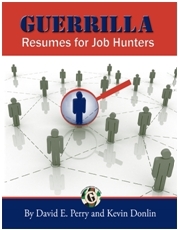 Because it's a true guerrilla job search tip, you won't find it in any traditional job search book. Instead, you'll find it in The Little Black Book of Connections, by Jeffrey Gitomer. He's a favorite of both David and myself. Gitomer says that the key to making good networking connections is to start with your own. "Your lawyer knows other lawyers. Your accountant knows other accountants. And they both know all of their clients and can potentially leverage your position with a third-party introduction," writes Gitomer. What does this mean for you? If you introduce the professionals in your network to each other, you can leverage the resulting good will to find new job leads. Example: Introduce your banker to your lawyer, or your accountant to a friend who owns a small business. They will all thank you ... and be more likely to introduce you to decision makers who can hire you. Action Steps: Why not get on the phone today and set up one lunch or coffee meeting for later this week? Matchmaking like this can increase the value of your network exponentially -- and get you hired. For me, Mark's story is an inspiration for Career Mavericks everywhere demonstrating that good guys do win. In a breathless résumé spanning 33 years, his changing interests and passions have led him to work variously as an auto mechanic, scuba diver, salesman, retailer, venture capitalist and manager in a municipal government business development agency.